SoundMagic PL50 review | What Hi-Fi? Hot on the heels of a very solid display from SoundMAGIC's PL30s last month come the upgraded PL50s, also supplied by hifiheadphones.co.uk. The big news is that the '50s boast balanced armature drivers, which are designed to improve efficiency and sound quality, and are usually seen on earphones costing much more than £55. What's most impressive about the PL50s is how unobtrusive they are, both in terms of fit and performance. Take some time to find the right buds for your ear (there are seven pairs in the box) and the fit is snug and comfortable enough to make it easy to forget they're there. Then there's the sound; all smooth, spacious and flowing, with nary a hint of anything harsh. Play Bombay Bicycle Club's Always Like This and (assuming you've got a good fit) the bassline bounces along in playful, infectious style, feeding up to full, clear vocals, and creating all-round envelopment. As we've mentioned, there's no harshness here, but it's also fair to say that the treble is a little behind the mid and bass in the mix. It isn't as sparkly as the best either, and there are rivals with greater overall attack. 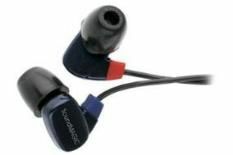 However, if you're the kind of person who frequently finds the average in-ear a bit uncomfortable, either sonically or physically, these may well be for you.